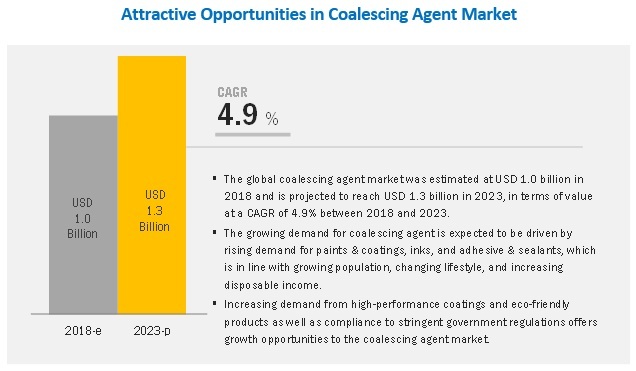 [119 Pages Report] The coalescing agent market size is projected to grow from USD 1.0 billion in 2018 to USD 1.3 billion by 2023, at a CAGR of 4.9%. Coalescing agents are typically solvents which help optimize the film formation process of polymer emulsion. Coalescing agents are used as an additive to reduce the minimum film formation temperature, resulting in optimized film coherence and improve film properties such as scrub resistance, abrasion resistance, mechanical properties, and appearance. The hydrophilic segment is expected to witness higher growth during the forecast period. The coalescing agents market has been classified based on type as hydrophilic and hydrophobic. The hydrophilic segment of the market is projected to witness the higher CAGR during the forecast period. Hydrophilic coalescing agents are categorized into water soluble and low water soluble. Low water-soluble hydrophilic is one of the most commonly used coalescing agent owing to their high efficiency, low water solubility, and reduced risk of penetrating in the porous substrate. Furthermore, increasing demand for environment-friendly coalescing agent also supports the growth of the hydrophilic segment. The paints & coatings segment accounts for the largest market share of the overall market. Based on application, the coalescing agents market has been segmented into paints & coatings, inks, adhesive & sealants, personal care ingredient, and others. The paints & coatings application segment is projected to lead the overall coalescing agents market during the forecast period. The large market size in this segment is mainly attributed to the high demand in various end-use industry such as construction, automotive, furniture & wood working, and others. Increasing demand for high-performance coatings for application such as coil, marine, automotive, OEM refinish drives the demand for coalescing agent in this segment. The APAC region is the largest consumer of coalescing agents across the globe. The APAC coalescing agents market is also projected to witness the highest CAGR between 2018 and 2023. Strong economic growth and increasing manufacturing output are majorly driving the demand for coalescing agents in the region. 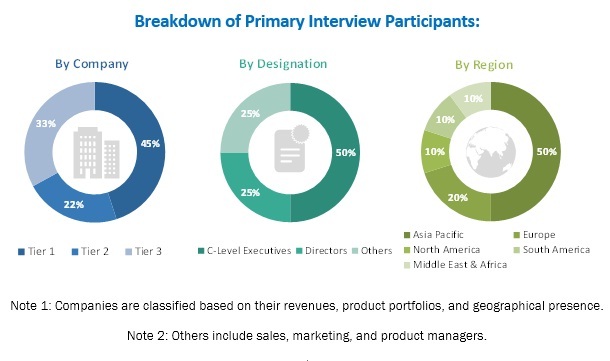 Some of the key players operating in the coalescing agents market are Elementis Plc (UK), Eastman Chemical Company (US), Synthomer Plc (UK), DowDuPont (US), BASF SE (Germany), Croda International Plc (UK), Evonik Industries AG (Germany), Arkema Group (France), and Celanese Corporation (US). Competition among these players is high and, they mostly compete with each other on prices and quality of their products and product customization. In June 2018, The Dow Chemical Company (US) announced a series of phased expansion of its global glycol capacity through a series of seven debottlenecking and incremental expansion projects. The company will increase the production capacity of select p-series and performance glycol ethers, including the DOWANOL Glycol Ethers product line. In November 2017, Evonik Industries AG (Germany) signed an agreement to acquire the high-concentrates additive compounding business of 3M (US). This expanded the company’s specialty additives for plastic industry, including solid additives. In March 2017, Synthomer Plc (UK) acquired Perstorp Oxo Belgium AB (Belgium), a niche performance additives business serving the industrial and decorative coatings industries. The company will focus on expanding Perstorp Belgium’s market position by leveraging its existing sales, technical services infrastructure, and operational performance. Which are the revenue pockets in coalescing agents market? What are the prime strategies of leaders in the coalescing agents market? What is the future product mix of coalescing agents market? The study involved four major activities to estimate the current market size for coalescing agents. Exhaustive secondary research was done to collect information on the market, peer market, and parent market. The next step was to validate these findings, assumptions, and sizing with industry experts across the value chain through primary research. Both top-down and bottom-up approaches were employed to estimate the complete market size. Thereafter, market breakdown and data triangulation were used to estimate the market size of the segments and the sub-segments. In the secondary research process, various secondary sources such as Hoovers, Bloomberg BusinessWeek, and Dun & Bradstreet have been referred to identify and collect information for this study. These secondary sources included annual reports, press releases & investor presentations of companies; white papers; certified publications; articles by recognized authors; gold standard & silver standard websites; food safety organizations; regulatory bodies; trade directories; and databases. The key players in the industry and markets are identified through extensive secondary research. After arriving at the overall market size-using the market size estimation processes as explained above, the market was split into several segments and sub-segments. In order to complete the overall market engineering process and arrive at the exact statistics of each market segment and sub-segments, the data triangulation and market breakdown procedures were employed, wherever applicable. The data was triangulated by studying various factors and trends from both the demand and supply sides in the coalescing agents market. Eastman Chemical Company (US), DowDuPont (US), BASF SE (Germany), Evonik Industries AG (Germany), and Synthomer Plc (UK), among others. Total 25 key players of coalescing agents market are covered. This research report categorizes the coalescing agents market based on type, application, and region.